It's elegant! It's the last word in clarity and accuracy - now in a hand-crafted simulated antique leather binding. It's an unexcelled blend of scholarship and beauty. 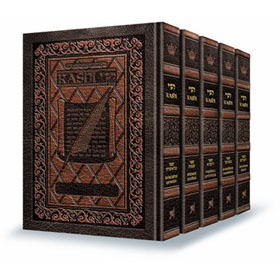 Your favorite Hebrew-English Chumash-Rashi with the ArtScroll translation and elucidation, in an elegant, embossed cover with the look and feel of heirloom-quality antique leather. But so economically priced! This set is comparable in look, feel, and durability to antique heirloom editions costing nearly $500. The leather-like embossed finish is reminiscent of the hand-tooled excellence of Old World bookbinders. Housed in a beautiful stamped and embossed matched-finish slipcase, this is a treasure to own, to use, and to give. This is unequivocally a perfect gift. At a price this low for a set so useful and beautiful, you'll be able to share the gift of elegance with others - for Chanukah, for Bar and Bas Mitzvas, for weddings and graduations, for birthdays - and don't forget one for yourself!